The intense and mechanical destruction of Belgium and Northern France in the First World War created a new and terrifying landscape that had hitherto only ever been imagined or seen in medieval visions of hell: one of mud and death unlike anything ever seen before. Saunders describes the landscape of the Western Front as an artefact, the product of human activity and not a natural process (Saunders 2004: 6). The resultant Mudscape became the landscape in which the war was fought and lived and a major part of the material culture of the war. A multi-disciplinary study of this material culture makes it possible both to understand the war in greater detail and to see the depth to which mud affected the conflict and the way it was fought. 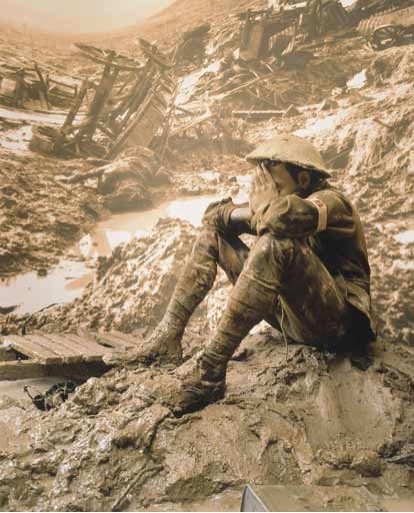 Almost every painting, photograph, poem, diary or book about the First World War involves mud. It is as much a part of the war as artillery or trenches, barbed wire or machine guns, hopelessness or heroism. Yet mud as material culture from the war does not exist for modern day observers, except in the literature and imagery of the time. One can visit museums and see tanks, guns, bullets, uniforms and so on. It is even possible to visit old trenches on the battlegrounds of Europe and beyond, but there are no museums of mud. It is not possible to see the mud as it was lived in and fought in and died in. the old battlefields are today either still off limits to the public or largely returned to farmland and rebuilt to their former towns and villages. Therefore the role of mud in the Great War is often overlooked, taken for granted and not fully understood. This essay will explore the nature of the landscape of the Western Front: the Mudscape that was home to millions of men. Landscape conducts memory and identity as well as any other piece of material culture from the First World War. It had a social life of its own and was well remembered by the soldiers of the Great War. John Masters describes a Second World War battlefield in Burma thus, “The Deep sector looked like Passchendaele – blasted trees, feet and twisted hands sticking up out of the earth, bloody shirts, ammunition clips, holes half full of water, each containing two pale, huge eyed men, trying to keep their rifles out of the mud, and over all the heavy, sweet stench of death…” (Masters 1961: 245), These references to the hell of the Great War by the soldiers of The Second World War (See Arthur 2005: 368, 406) are common, showing not only that the landscape of the First War lived long in the common memory, but also that landscape is a common object to those that fight in it, through all conflict. When looking at the battlefields of the Western Front today, it is almost impossible to imagine what they would have been like during the Great War. The corpses and detritus of war have long been cleared away or buried, the screeching noise of battle has been replaced by calming countryside tones and the pleasant country air has banished the stench of war. But the immediately obvious difference between the landscape of Northern France and Belgium today, and that of 1914-1918, is the colour. Today the fields are bright yellows, greens and reds, the colour of life and crops and poppies. During the Great War the colour was brown, grey and dead. The mud of the Great War was the remnants of human beings and of murdered nature, the by-product of modern industrial warfare fought on a scale that had never before been thought possible. It is not the same mud we know of today. The trenches of the Western Front were always “muddy”, even when it was dry. In Flanders the landscape is predominantly flat and the water table is high. Even in summer after only a few feet of digging the water appears (Corrigan 2003: 95) and summer rainfall is not uncommon in France. Further, the mud was not just wet earth, but a combination of many of the unpleasantnesses of war. In the dry men still bled and vomited and defecated and urinated, water and food were still spilt in the trenches and the earth contained the remains of thousands of rotting corpses. Back in England the realties of this world were simply not portrayed in the early years of the war. Take for example the exhibition trenches in Kensington Gardens: “clean, dry and well furnished, with straight sides and sandbags neatly aligned” (Fussell 1977: 43). Wilfred Owen referred to them as “the laughing stock of the British army” (Fussell 1977: 43). It was a far cry from the realities of life at the front. The squalid nature of the British trenches was neither imagined nor understood on the home front, but as the war progressed the reality did occasionally seep out. A Daily Mirror headline in late 1917 for example, accompanied by Warwick Brooke’s photograph (Fig 1), read: “That Eternal Mud – Flanders: One Vast Quagmire” (Liddle 1997: 384); but such descriptions of the front were rare. This lack of understanding contributed to the disorientation of British troops arriving in France and Belgium: having trained for war in the sterile environments of Salisbury Plain and other simulated battlegrounds, they were simply not prepared for the world in which they found themselves. The reality was that there was an enemy other than the Germans: the “Slimescape” of the frontlines (Das 2005: 39). 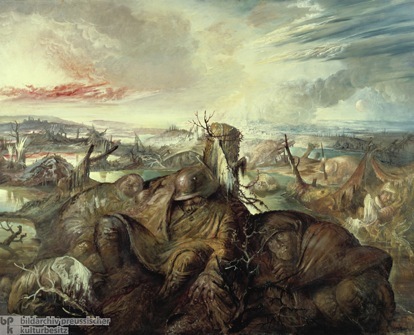 Das uses this term to describe the Front as a combination of mud and slime, a Landscape created by modern industrial weaponry, consisting of the pre-war (and indeed prehistoric) landscape of the front lines and the various detritus of war. It rapidly became apparent to new arrivals in the trenches that surviving the onslaught of the landscape would be as challenging as surviving the weaponry of the enemy. For the Allies life in the trenches was far worse than for the Germans. The excavations for the A19 Project at Ypres highlight the distinctions between the trenches of the two sides (Saunders et al 2009: 251-266). German trenches were usually built to a much higher standard than the Allied ones: Wattle work, corrugated iron, heavy wooden beams and concrete were all widely used to build the trenches securely and make them resilient to the weather and the mud (Saunders et al 2009: 254). Often German trenches were even described as comfortable, with electricity, kitchens and beds (Fussell 1977: 44). Junger refers to the German trenches as “Dugouts, that have evolved by now from rudimentary holes in the ground to proper enclosed living quarters, with beamed ceilings and plank-cladded walls” (Junger 1961: 41). Conversely Allied trenches were usually temporary in nature, squalid, badly drained and ill supported against cave in and damage. The front lines sometimes consisted only of shell holes in areas where the trenches had disappeared under bombardment or the lines had rushed forward into No-mans Land. The British philosophy of attack rather than defence ensured that little energy was wasted building expansive, lavish positions that would shortly be left behind by the large-scale attacks northward (Fussell 1977: 43). These conditions and attitudes towards the Allied positions allowed the degradation of the landscape to hamper the troops and become their most bitter enemy. The earth was churned up so ferociously that it took on the form of a sea of mud that seemed to have no beginning or end. Images of this new kind of landscape were a common theme in the photography, art and literature of the time. 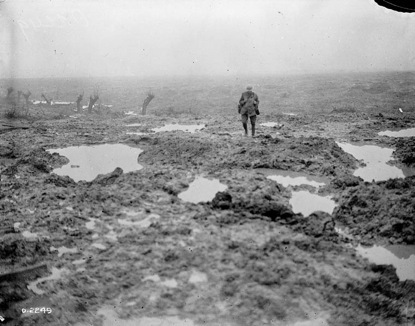 William Rider-Rider’s photograph after the Battle of Passchendaele (Fig 2) shows this sense of endlessness: “the sky lies in tatters in the mud” (Dyer 2009: 119). 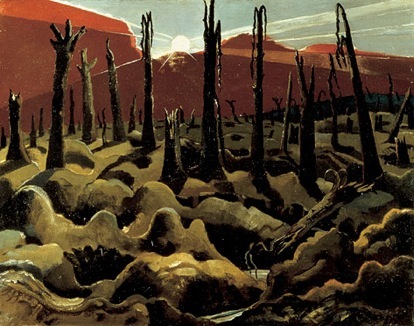 The idea of the landscape having a dissolution of form, or “the death of Landscape” (Hynes 1992: 189-202) is a common theme in the photography and art of the Great War. The war had “annihilated nature and with it the tradition of romantic landscape” (Hynes 1992: 196): The surgeon and anthropologist Robert Briffault described the front as, “Mile after mile the earth stretched out black, foul, putrescent. Like a sea of excrement…. It was one vast scrap-heap. And, scattered over or sunk in the refuse and mud, were the rotting bodies of men, of horses and mules. Of such material was the barren waste that stretched as far as the eye could see” (Europa in Limbo quoted in Liddle 1997: 430). without the traditional reference points in the landscape, art changed drastically. Paul Nash’s “We are Making a New World” (Fig 3) shows the landscape so broken that it appears to move in waves: the picture is more a seascape than a landscape. Nevinson’s “After A Push” portrays the battlefield after heavy artillery had done its work. The ridges between the shell holes seem like waves of mud and the deadly shell-holes that could consume men, horses and equipment whole, seem almost bottomless (Fig 4). Otto Dix takes the idea of the landscape as a sea of mud further. 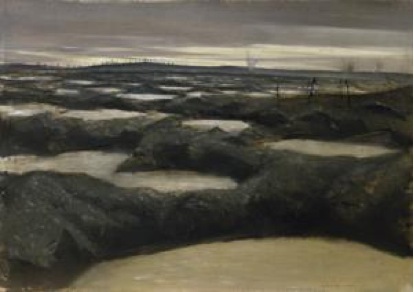 His haunting picture “Flanders” portrays the front as a muddy version of hell. Soldiers dead and alive are being consumed by mud and slime. Their bodies are the breakers of large waves and the never-ending sea of mud slowly consumes them. 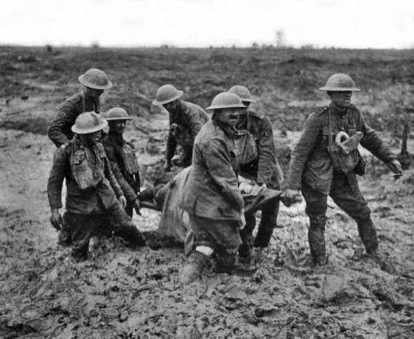 The soldier in the foreground, coated in thick filth, seems to be sheltering in the mud, making a home in it. The hell and mud of the Western Front influenced the work of war poets and artists and also that of authors. It seems that once experienced the mud could not be forgotten. JRR Tolkien was not on the Western Front for long, but he did experience life in the trenches on the Somme and what he referred to as the “animal horror” never left him (Carpenter 1977: 84). His experience influenced his portrayal of the bleak, muddy and barren landscape in “The Lord of the Rings”. He wrote in a letter in 1960 that “The Dead Marshes and the approaches to the Morannon owe something to Northern France after the Battle of the Somme” (Carpenter (ed) 1995: 303). In the book Sam Gamgee refers to seeing “dead things, dead faces in the water”, in the stinking muddy mire of the Dead Marshes, (Tolkien 2008: 820) likely a reference to corpses witnessed by Tolkien in the mud of the Somme, akin to Dix’s “Flanders”. Descriptions of the muddy landscape of the Front are also common in the humorous literature of the time. Bruce Bairnsfather’s “Old Bill” cartoons often turned a humorous eye on the appalling conditions. Cartoons such as “the Communications Trench” showed how soldiers dealt with the reality of the world in which they lived (Fig 6). The famous trench newspaper The Wipers Times made countless references to the horrendous muddy nature of the landscape, from amusing adverts such as that for the “Tunnel & Dug Out Vacuum Cleaning Company” (Fig 7) to articles entitled, “More Mud Than Glory” (Beaver et al 1973: 212), “Roads” (Beaver et al 1973: 205), with the first line being “Belgium, rain, and a sea of mud” and the headline, “Three Submarines Have Been Mined on the Menin Road” (Beaver et al 1973: 247). The art and literary material culture from the war show time and time again how the soldiers perceived the mud of the war. Life in the trenches was a surreal experience. Fussell uses the term “Troglodyte world” (Fussell 1977: 36-74) to describe men reduced to living like animals beneath ground in trenches and dug-outs in a world of mud: the literature of the Great War frequently makes use of words such as creep, burrow and crawl, language more associated with wildlife than human beings. Patrick McGill, a stretcher-bearer on the Western Front, remarked “a soldier came crawling towards us on his belly, looking for all the world like a gigantic lobster that had escaped from its basket” (Das 2005: 44). The reality of life in the frontline was that to be above ground in daylight meant almost certain death and under the constant barrages the closer to the ground one could get the safer one would feel. This close proximity to the earth and the mud meant that all the senses were exposed to it. Touch and smell became as important as sight when experiencing the ubiquitous mud and these senses became essential in adapting to the spatial disorientation that trench life inflicted. To peer over the trenches was extremely dangerous and so the other senses became heightened: “the act of seeing became closely associated with death” (Gygi 2004:76). The working day in the trenches started at nightfall giving even greater importance to senses other than sight; this sensual awareness of fighting marks the real experience of life in the firing line (Das 2005: 74). W Beach Thomas wrote of the Somme, “everything visible, audible or tangible to the sense – to touch, smell and perception – is ugly beyond imagination (Das 2005: 74). This sensual experience was so intense that often it seemed that the human skin was the only barrier between the filth and the body. Towards the end of All Quiet on the Western Front Remarque writes, “Those who still wear high boots tie sand bags round the top so that the mud does not pour in so fast. The rifles are caked, the uniforms caked, everything is fluid and dissolved, the earth one dripping, soaked, oily mass in which lie the yellow pools with red spiral streams of blood and into which the dead, wounded, and survivors slowly sink down… Our hands are earth, our bodies clay and our eyes pools of rain. We do not know whether we still live” (Remarque 1929: 283-284): the skin could not always separate the self and the world (Das 2005: 52). This quotation also alludes to how hated the mud was. Sassoon in his work, “Memoirs of an Infantry Officer” describes wiping the mud from the face of a dead German (Sassoon 1997: 57), seemingly the mud coating the German’s skin makes the death of the young soldier worse, somehow ugly and detracts from the soldier’s humanity, the mud of the front was turning humans into something more akin to animals or things (Das 2005: 119). These images and quotes show the degree that the landscape permeated the troops lives and to just what depth the mud was experienced. The world the men were forced to live in became all-consuming and the ground a living entity – a landscape alive with the dead, as if taking revenge for the destruction wrought upon it by man. The mud did not just make life virtually unbearable – It killed as well. As one soldier wrote of Passchendaele, a battle forever to be associated with mud, “Our attacking troops plodded on through this (slimy mud) until all but beaten by physical exhaustion. Many never rose from the mire” (Unknown 2006: 9). Nature came to be seen as a monster, sucking men down into the bowels of the earth. Jack Dillon, a Lewis Gunner at Passchendaele described it thus, “The mud there wasn’t liquid, it wasn’t porridge, it was a curious kind of sucking kind of mud. When you got off track with your load, it ‘drew’ at you, not like quicksand, but a real monster that sucked at you” (Das 2005: 45). Thousands of men fell into the mud never to be seen again. They became part of the landscape of the missing; their memory dominates Northern France and Flanders today, both spiritually by their presence of absence and physically, remembered on giant memorials built after the war such as Monument to the Missing at Thiepval on the Somme (Winter 1995: 105-106) and the Menin Gate at Ypres (see Saunders in Bender et al 2001: 46). The mass deaths and the disappearance of the “missing” gave rise to notions of the landscape itself being a cemetery. A survivor of the Ypres Salient described being in the British trenches as “this stinking world of sticky, trickling earth ceilinged by a strip of threatening sky” (Fussell 1977: 51): a metaphor for the trenches and shell-holes as open graves, mud and rancid stinking earth on all sides with only a ceiling of lethal light, waiting to be closed by a coffin lid of mud. Blunden refers to the landscape as “mud, and death, and life” (Quoted in Das 2005: 67) in his “Undertones of War”, highlighting the inextricable connection between the reality of the War and the landscape in which it was waged. The mechanical destruction had a by-product of giving men a closer appreciation of nature. As they witnessed the terrifying power of modernity, somehow sending the world back to the stone age, they began to identify the mass killings with the destruction of the landscape (Mosse 1990: 107-108). Man was murdering nature through industrial war and nature was murdering man through the ever-present mud and water and slime. Paradoxically the landscape that engulfed so many could also return them to the surface. Men who had been suddenly buried by explosions could be rescued from the ground, pulled up from the slime to safety, resurrected: symbols of destruction and death turned to symbols of life and hope (Mosse 1990: 108). The importance of nature to the belligerents of the First World War is an important factor in understanding its realities. German cemeteries for example often took the form of Heroes’ Groves: mass graves in natural areas of beauty that would show no crosses or headstones – often trees would be planted instead – and symbolised the belief that the bodies would become part of the changing seasons, “from the death of winter to the resurrection of spring” (Mosse 1990: 44). This connection between nature and life at the front is intrinsic to the understanding of how life in the trenches was experienced and understood by the men. Junger wrote in his seminal work The Storm of Steel, that whilst wandering through the rear lines he noticed that, “nature seemed to be pleasantly intact, and yet the war had given it a suggestion of heroism and melancholy…. The simple soul is convinced here that his life is deeply embedded in nature, and that his death is no end” (Junger 1961: 143). Nature, landscape, industrial weaponry and the world they created are valuable pieces of First World War material culture and their exploration can reveal much to the modern observer about how the war was experienced. Military History has described much of the war in detail. The records of which regiments attacked where and what weaponry was used when are extremely comprehensive. So are the casualty lists, meticulously collated and often cited to describe the horrors of the First World War. These facts and figures explain to us what happened, but not the context in which they happened. They do not tell of the daily life of the soldier, or of the landscape in which he lived, fought and often died. The mud of the Western Front is mentioned in the literature, art, poetry, memoirs and memories of the time perhaps more than any other object of the war. It hugely affected how the war was fought as well as how life was experienced by the men in the front lines. It produced a social and cultural landscape that affected every aspect of a soldier’s life. The landscape was felt, tasted and smelt. It was lived on and in and became a living object that the soldiers grew to understand and admire as well as dread and hate. Dyer argues that The Great War “ruined the idea of ruins” (Dyer 2009: 120): things did not crumble and decay, but were swept away by the weaponry deployed. This not only applied to the conflict landscape of the war, but also to the ideas of how war would be fought and experienced by the soldiers who fought and died in them. The mud of the Western Front was well understood by the men that fought in it, and so must be the case for the modern observer, if the realities of the Great War and its legacies are to be fully understood. Arthur, M. (2005). Forgotten Voices of The Second World War. London: Ebury Press. Beaver, P and Williamson, H. (1973). The Wipers Times. London: Peter Davies Ltd.
Bender, B and Winer, M. (eds). (2001). Contested Landscapes Movement, Exile and Place. Oxford: Berg. Carpenter, H. (1977). J.R.R Tolkien: A Biography. London: George Allen & Unwin Ltd.
— (ed). (1995). The Letters of J.R.R Tolkien. London: Houghton Mifflin. Corrigan, G. (2003). Mud Blood and Poppycock. London: Cassell. Das, S. (2005). Touch and Intimacy in First World War Literature. New York: Cambridge University Press. Dyer, G. (2009). The Missing of The Somme. London: Phoenix. Fussell, P. (1977). The Great War and Modern Memory. New York: Oxford University Press. Gygi, F. (2004). Shattered Experiences – recycled relics: Strategies of representation and the legacy of the Great War. In Saunders ,NJ .(ed). Matters of Conflict: Material Culture, Memory and the First World War, pp 72-89. London: Routledge. Hynes, S. (1992). A War Imagined – The First World War and English Literature. London: Pimlico. Junger, E .(1961). The Storm of Steel. London: Penguin Books. Liddle, P. (ed). (1997). Passchendaele In Perspective, The Third Battle of Ypres. London: Pen and Sword Books Ltd.
Masters, J. (1961). The Road Past Mandalay. London: Cassell. Mosse, G, L. (1990). Fallen Soldiers, Reshaping The Memory of The World Wars. Oxford: Oxford University Press. Remarque, E. (1929). All Quiet on the Western Front. Little Brown: Boston. Saunders, N, J. (2004). (ed). Matters of Conflict Material culture, memory and the First World War. London: Routledge. Sassoon, S .(1997). Memoirs of an Infantry Officer. London: Faber and Faber Ltd.
Tolkien, J, R, R. (2008). The Two Towers (The Second Book of The Lord of The Rings). London: Harper Collins. Unknown. (2006). A Month at the Front – The Diary of an Unknown Soldier. Oxford: Bodleian Library. Winter, J. (1995). Sites of Memory, Sites of Mourning, The Great War in European History. Cambridge: Cambridge University Press.